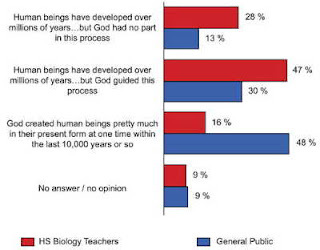 So what percentage of US science teachers are creationists? Hmm...16%!! However, a quarter of the teachers also reported spending at least some time teaching about creationism or intelligent design. Of these, 48% – about 12.5% of the total survey – said they taught it as a "valid, scientific alternative to Darwinian explanations for the origin of species". These findings strongly suggest that victory in the courts is not enough for the scientific community to ensure that evolution is included in high school science courses. Nor is success in persuading states to adopt rigorous content standards consistent with recommendations of the National Academy of Sciences and other scientific organizations. Scientists concerned about the quality of evolution instruction might have a bigger impact in the classroom by focusing on the certification standards for high school biology teachers. Our study suggests that requiring all teachers to complete a course in evolutionary biology would have a substantial impact on the emphasis on evolution and its centrality in high school biology courses. In the long run, the impact of such a change could have a more far reaching effect than the victories in courts and in state governments. Read the full paper here, and the New Scientist story here. 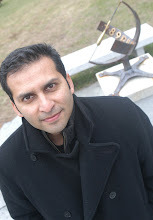 You know, Salman, I like your blog, but one of these days it is going to drive me to drink. Or just start weeping in public. Neither would be a particularly pretty sight. While the creationist science teacher news is depressing (and so is the John Hagee story), check out George Coyne's lecture (or at least the Q&A session) for some good-natured science & religion interaction and humor.